As it says on the tin: despite growth in earnings, the numbers of U.S. companies that are struggling with interest payments on the gargantuan mountain of corporate debt they carry remains high. 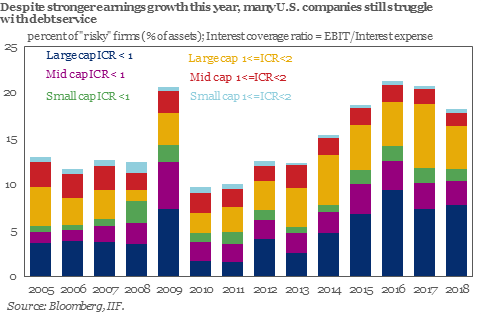 The chart does not show those companies with EBIT/interest cover ratio below 1 that are at risk (e.g. with the ratio closer to 0.9) for the short term impact of rising interest rates. That said, the overall percent of firms classified as risky is at the third highest since the peak of the GFC. And that is some doing, given a decade of extremely low cost of debt financing.